Hi! I'm a Jill married to a Jack - yes really! We have four grown children, six grandchildren, 2 black Lab mix rescue dogs, a 9 year old pug dog just rescued, and multiple grand-dogs. I'm retired from the corporate world but I have a home-based Isagenix business. I love to rug hook, design folk art, and play in my studio as well as work in my veggie garden. I so enjoy all of the adventures every day has to offer. 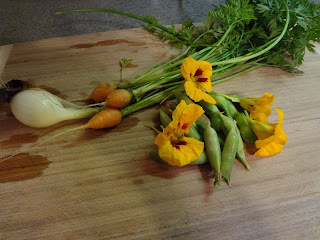 I can't wait to add the first bounty (baby onion, Paris Market tiny carrots, Ladybird nasturtiums, and Tom Thumb peas) from our garden to the wonderful organic lettuce and herb mix that our daughter, Isia and her husband, Chris grew at their Crack In The Sidewalk Farmlet. If any of you are near Atlanta, be sure not to miss the weekly farm market at the Grant Park zoo each Sunday morning/early afternoon. Crack In The Sidewalk is there along with lots of other vendors. Not only fresh fruits and veggies but cheese, bakery items, local honey, dairy products, meats - it's wonderful! Ohhhhh, bet the Atlanta farmers market is truly fabulous! Love the name, Crack in the Sidewalk, so cute, Jill. A great bounty indeed wow! I loved reading about the painted floorcloth class too! Joe and I will be checking out the farmers market. Glad you shared!